Frances Melville, as Mistress of Queen Margaret College, was responsible for all women students at the University of Glasgow from 1909 to 1935. Her honorary LLD in 1927 was the first to be awarded to a Scottish woman graduate. "there is often ignorance on the part of the young graduate of her sometimes precarious, and often unsatisfactory, status and prospects in the Universities, in the Civil Service, in the professions (such as medicine and, occasionally, teaching). She does not know at first of her exclusions, of her hampered promotions. All has seemed well and equal as between men and women while the academic course has lasted." Melville was active and a leader in many areas of women's higher education, including the presidency of the British Federation of University Women in 1935. 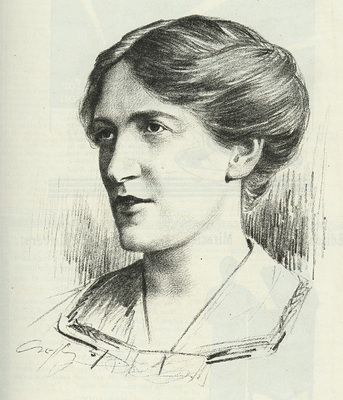 She was a confirmed suffragist who held key posts in several constitutional suffrage societies and took a direct part in the 'Scottish women graduates' case' from 1906 to 1908, arguing that under the 1868 Representation of the People (Scotland) Act 'person' did not mean only male voters. During the First World War she devoted her energies to a number of advisory and administrative roles concerned with women’s training. After the war she focussed her attention on improving equal opportunities for women in many areas of society and was often publically critical of universities and other masculine institutions. She was honoured with an OBE in 1935. Frances Helen Melville (1873-1962) was a suffragist and a prominent campaigner for greater access to higher education for women. She was Mistress of Queen Margaret College, 1909 to 1935 and was awarded an honorary LLD by the University in 1927. Born in Edinburgh, Melville matriculated at the University of Edinburgh in 1892 and graduated with a first-class honours MA degree in Philosophy in 1897. From 1896 until 1899 she worked as a tutor at the University of Edinburgh, then after a short spell as lecturer in Mental and Moral Science at the Cheltenham Ladies' College she became warden of University Hall at the University of St Andrews. In 1910 she became the first woman to graduate BD at a Scottish university. Melville was Mistress of Queen Margaret College from 1909 until it closed in 1935. In 1927 she was the first Scottish woman graduate to receive an honorary degree from the University. She was a prominent member of the Scottish Universities Women's Suffrage Union and Honorary President of the Glasgow Women's Citizens' Association, and she stood as an Independent for the Scottish Universities seat in a bye-election in 1938. She was awarded an OBE in 1935. Hamilton, Sheila. Melville, Frances Helen (1873–1962). Dictionary of Natinal Biography. Melville, F. 1911. The education of wome. In Lodge, Oliver. The position of women: Actual and Ideal. London: James Nesbit and Co.
Moore, Lindy. 2006. Melville, Frances Helen. In The Biographical Dictionary of Scottish Women. 263. Edinburgh: Edinburgh University Press. The University of Glasgow awarded the first honorary degree to a Scottish female academic, Frances Melville in 1927. World Changing Project, "Leading administrator of women's university education ," in University of Glasgow World Changing (University of Glasgow, 2010); http://www.worldchanging.glasgow.ac.uk/article/?id=99 (accessed April 25, 2019). World Changing Project. "Leading administrator of women's university education ." In University of Glasgow World Changing. University of Glasgow, 2010. http://www.worldchanging.glasgow.ac.uk/article/?id=99 (accessed April 25, 2019). World Changing Project. "Leading administrator of women's university education ." University of Glasgow World Changing. University of Glasgow, 2010. 25 April 2019 <http://www.worldchanging.glasgow.ac.uk/article/?id=99>.